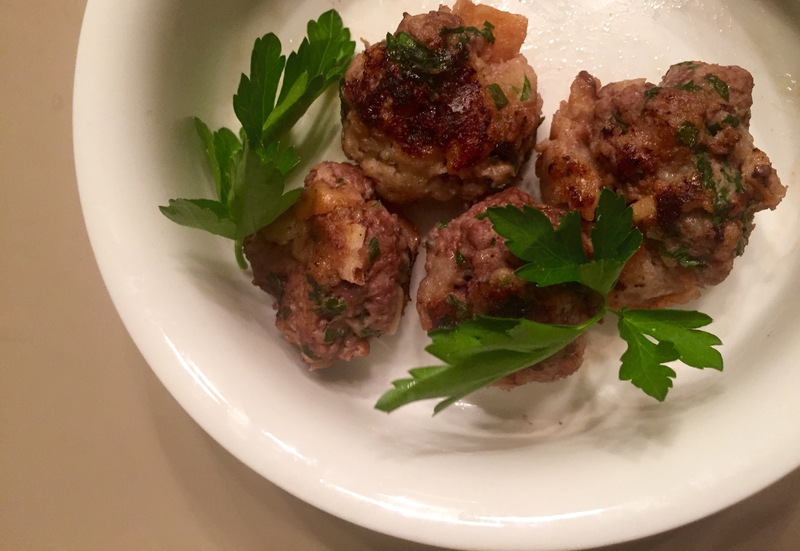 What: A very slightly simplified version of my absolute favorite classic Italian Meatballs (our favorite recipe here uses three different meats to make them extra delicious) presented in a egg-free format and made mini for fast cooking and easy handling for little hands. When: This recipe requires a half a pound of beef (though it is easily doubled) so it’s great to use if you have an odd amount of leftover ground meat, say, after taco night, for example. Why: Served alone, in soups, or over pasta, these little bites are irresistible to kids. How: Once the balls are formed, choose your own cooking method. You can bake these in the oven or, as we normally do, fry them slowly in oil over a medium low flame, turning once, until fully cooked. Slice into one to be sure. These are great defrosted from the freezer and you can easily double the recipe to make a very large batch. *NOTE: I had to make this egg-free for our son’s dietary needs but you are welcome to add one egg. It will bind them a bit better but if you use a light touch, the recipe below will work just fine. Take the Bread and place it in a small bowl. Pour Milk over the Breadcrumbs and soak for a minute. Combine all the rest of the ingredients except for the Olive Oil in a large bowl. Fold in the milk-soaked Breadcrumbs and using your hands, blend until combined. Form this mix into 1 inch meatballs and prepare according to your favorite method (oven or fried on your stovetop). To bake, preheat oven to 400 degrees and bake on a greased cookie sheet for 15-17 minutes. To fry, pour 1/8 inch deep of Olive Oil in a skillet with sides.Turn flame to medium low and cook low and slow, rotating once, until Meatballs are cooked through. Serve right away or freeze. Enjoy! So good! My son really enjoyed these. And so did I actually. Happy to hear it, Bianca! These are a favorite in our house. They are always a hit with my little guy too. Thanks for reading!